This recipe was given to me by a co-worker’s Mimi (grandmother) when I lived in Atlanta and worked at the Blue Rooster Cafe in Lilburn, GA. Fudge was not sold at the cafe, I just made it in the back for the staff. On one such occassion, I had a faccident (fudge making accident) and burned my arm really bad and I still have the scars to prove it! Regardless, this is some of the best fudge I’ve ever had. It’s the real deal. Thank you, Mimi! 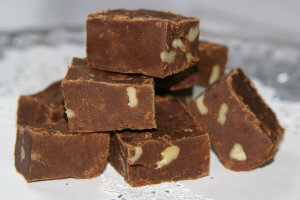 If you love real old fashioned fudge like Grandma used to make, check this recipe out! Previous Post: « Brownies You’ll Be Famous For!